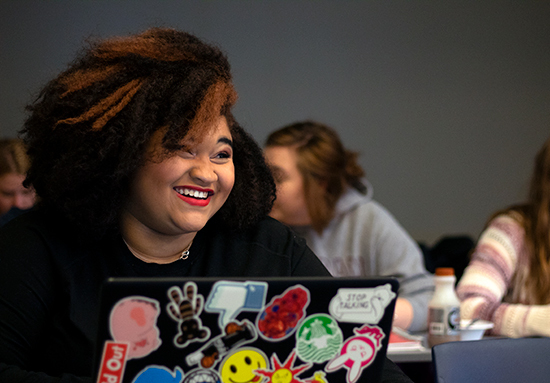 As the past president of the Black Student Alliance (BSA) and now the current vice president of the Student Government Association (SGA), Anaya Phoenix ’19, loves to help others. Whether it’s by a small act of kindness or a big gesture, Phoenix is happiest when helping other people. Phoenix, an English literature and writing major at SUNY Potsdam, was very introverted and reserved as a high school student. When she came to Potsdam, she started to come out of her shell and get involved in a variety of clubs and organizations on campus. Now with SGA, she has taken on an even larger leadership role in the pursuit of helping others. From once being the quiet student in the back of the classroom, to now being one of the voices of the student body. She is a confident, bubbly person who students see around campus every day. “When I came to college, I was 17 and scared. I was very far from home. I’m from New York City and my first semester I tanked. I even failed a class. I went home and my mom said, ‘You need to reevaluate what you’re doing before you waste time and money.’ And I thought, yeah, you’re right! I realized that I wanted to be here. I wanted to better myself and I didn’t want to hold myself back. So, my second semester was really good, and then the semester after that was really good. From there I had a boost in confidence, and this burst of energy to learn new things and be more active, such as getting involved in clubs and making new friends. My personal, emotional and academic growth has been my greatest triumph,” Phoenix said. As part of her development as a student, she has become a central leader for SGA. Last fall, she joined other members of the SGA eboard, to organize a candlelight vigil on campus in remembrance of the victims of the October 2018 synagogue shooting in Pittsburg, Penn. After many students on campus were struggling emotionally in the aftermath of the shooting, Phoenix came up with the idea to hold the vigil in Minerva Plaza. She also collaborated with other student organizations such as BSA and Four College Hilel, whose members spoke at the event. “I noticed that students on campus were suffering, as they always are when things of this nature continuously happen, and I knew that we had to do something about it,” Phoenix said. When she’s not involved with student organizations on campus, Phoenix is most passionate about studying literature, as well as composing her own fictional pieces—three of which she has had published in the past. “I like reading a good book, deeply analyzing it and figuring out what’s going on. I love writing,” she said. As she continues to take classes at SUNY Potsdam, she has been most influenced by Associate Professors James Donahue and Sheila McIntyre. After taking Introduction to Literature with Donahue and American History with McIntyre, she was impressed with their authenticity and how they were able to engage their students in dynamic and intellectual conversations. “These Professors have taught me what good teaching is all about, and that’s really important to me because I aspire to be an educator as well,” she said. Phoenix will be pursuing a Master of Science in Teaching after graduation this spring. She hopes to share her passion for reading and writing with her future students as she aspires to be a high school English teacher.